Our office doesn’t just provide dental treatment. We value you as a patient, attending to your comfort, safety and employing the latest techniques and equipment available in modern dentistry. We pride ourselves in being a “Full Service” family dental practice with an emphasis on comprehensive, restorative and esthetic dental care. To help patients who are anxious about dental treatment, we routinely offer nitrous oxide (laughing gas). Furthermore, we are trained in utilizing oral sedative pre-medications and IV (intravenous) sedative when these situations are necessary. Cosmetic improvements to your teeth including tooth bleaching and direct dental bonding to correct small chips and spaces. Natural looking “metal free” composite fillings. Emergency care for dental accidents and root canal treatment pain relief. Extractions and other oral surgery. Tooth straightening and orthodontic evaluations for adults and children. Therapy for chronic headaches and TMJ problems including the use of comfortable nighttime “Biteguards”. Preventative care including regular dental hygiene treatments, fluoride applications for greater cavity resistance and dental sealants to help eliminate the threat of decay. 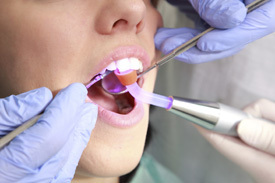 Periodontal evaluation and treatment for adult gum disease.